Anthony Smith, 51, of Wybank Caravan Site, Arundel, pleaded guilty to drink driving (125mcg alcohol in 100ml breath, compared with the legal limit of 35mcg), driving without due care and attention, driving without a licence, and driving without insurance in Cuckfield Road, Burgess Hill, and to failing to stop for a police officer in Isaacs Lane, Burgess Hill, and to failing to answer bail. He was jailed for 16 weeks, banned from driving for 34 months, and a £115 victim services surcharge. Richard Boxall, 54, of Southdown Close, Haywards Heath, pleaded guilty to speeding on the M23 at Pease Pottage. He was fined £233, with a £30 victim services surcharge, £85 costs, and four penalty points added to his licence. Donald MacDonald, 58, of Orchard Road, Burgess Hill, was convicted of failing to identify a driver suspected of speeding on the A23 at Bolney. He was fined £660, with a £66 victim services surcharge, £85 costs, and six penalty points added to his licence. Mark Mink, 47, of The Street, Bramber, was convicted of failing to identify a driver suspected of speeding on the A23 at Albourne. He was fined £660, with a £66 victim services surcharge, £85 costs, and six penalty points added to his licence. Jordan Morey, 23, of Rushy Grove, Haywards Heath, was convicted of failing to identify a driver suspected of speeding in Gatwick Road, Crawley. He was fined £660, with a £66 victim services surcharge, £85 costs, and six penalty points added to his licence. Vlad Rotaru, 29, of Woodland Avenue, Burgess Hill, pleaded guilty to speeding on the A259 at Hove. He was fined £218, with a £30 victim services surcharge, £85 costs, and three penalty points added to his licence. Chris Welch, 42, of Sussex Road, Haywards Heath, was convicted of driving while not wearing a seat belt in Gatwick Road, Crawley. He was fined £220, with a £30 victim services surcharge, and £85 costs. Ashley Garrett, 58, of Crescent Way, Burgess Hill, was found guilty of breaching a non-molestation order by going to an address in Burgess Hill. He was fined £120, with a £30 victim services surcharge, and £185 costs. Pache Holland, 19, of London Road, Burgess Hill, pleaded guilty to drink driving (45mcg alcohol in 100ml breath, compared with the legal limit of 35mcg) in Crescent Way, Burgess Hill. She was banned from driving for a year, with a £120 fine, a £30 victim services surcharge, and £120 costs. Ryan Hyde, 47, of Covert Mead, Handcross, was convicted in his absence of driving after having his licence revoked, in Brighton Road, Crawley. He was fined £660, with a £66 victim services surcharge, £85 costs, and six penalty points added to his licence. Alexander Fisher, 32, of Lucastes Lane, Haywards Heath, pleaded guilty to failing to identify a driver suspected of driving without a sealtbelt on the A270 at Hove. He was fined £500, with a £50 victim services surcharge, and £85 costs. 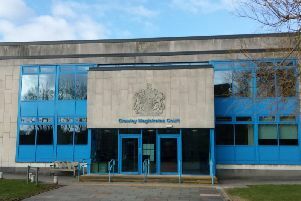 Scott Lucey, 62, of Holly Road, Haywards Heath, pleaded guilty to drink driving (145mg alcohol in 100ml blood, compared with the legal limit of 80mg) in Priory Way, Haywards Heath. He was banned from driving for 17 months, with a £120 fine, a £30 victim services surcharge, and £85 costs. Aaron Bailey, 21, of Wivelsfield Road, Haywards Heath, pleaded guilty to driving while disqualified in Jobs Lane, Haywards Heath. He was banned from driving for 27 months, and given a community order with 40 hours of unpaid work, an £85 victim services surcharge, and £85 costs. Elizabeth Collins, 32, of no fixed address, pleaded guilty to failing to provide a blood alcohol specimen, and driving without a licence, in London Road, Burgess Hill. She was banned from driving for a year, and given a community order with an £85 victim services surcharge, and £85 costs. Vojka Nikolaeva, 28, of Covington Way, Norbury, pleaded guilty to theft of a purse in Haywards Heath. She was fined £207, with a £30 victim services surcharge, and £85 costs. Philip Helmore, 32, of Sycamore Drive, Burgess Hill, pleaded guilty to drink driving (91mcg alcohol in 100ml breath, compared with the legal limit of 35mg) on the A272 at Lindfield. He was banned from driving for 23 months, and given a community order with 100 hours of unpaid work, an £85 victim services surcharge, and £85 costs. Carly Caswell, 32, of Kilnbarn Way, Haywards Heath, pleaded guilty to three counts of theft of candles (value: £287.88, £294.64, and £95.96) from Southdowns Garden Centre in Hassocks. She was ordered to pay £582.52 compensation. Sarah Mitchell, 25, of Tandridge Lane, Lingfield, pleaded guilty to driving with illegal levels of a cocaine metabolite and a cannabis metabolite in her blood, on the A264 at Copthorne. She was banned from driving for three years, with a £160 fine, a £30 victim services surcharge, and £85 costs.